A team of astronomers has discovered a stable structure around one of the most massive, newly forming stars in our galaxy, revealing how some stars manage to reach masses of more than a hundred times that of our Sun. Stars count lightweights and heavyweights among their number. All are born in clouds of gas and dust, but the more massive a baby star, the earlier nuclear fusion ignites in its core. And the radiation pressure produced here should really purge its surroundings and thus prevent the infall of matter which will allow the star to grow bigger. Some stars nevertheless manage to reach masses of more than a hundred times that of our Sun. How is this possible? The team headed by Katharine Johnston from the University of Leeds, and including the Max Planck astronomers Thomas Robitaille, Henrik Beuther, Hendrik Linz and Roy van Boekel, turned their sights on the object with catalog number AFGL 4176. It is a very massive star in the southern constellation known as Centaurus, around 14,000 light years from Earth. The star is in the process of being born, which is why its immediate environment is concealed within an envelope of gas and dust. The scientists observed the star in the millimeter and submillimeter range with the ALMA observatory of the European Southern Observatory (ESO), however – and looked behind the veil and into the interior of the envelope. They detected a disk-like, rotating structure. To confirm this observation, the astronomers arranged a kind of identification parade: first they simulated more than 10,000 model disks with different properties. They then compared these images and spectra with the data obtained from nature. The best agreement was for a stable disk, where the gravitational effects of both the star and the disk material are important. The radius of the disk surrounding AFGL 4176 is roughly 2000 times the average distance between the Earth and the Sun. The total mass is 12 solar masses – this corresponds to just under half the weight of the star itself, which is roughly 25 solar masses. The disk rotates around the star in a similar way to the planets around our Sun: the gas in the inner regions moves faster than that in the outer ones and obeys the laws discovered by Johannes Kepler at the beginning of the 17th century. 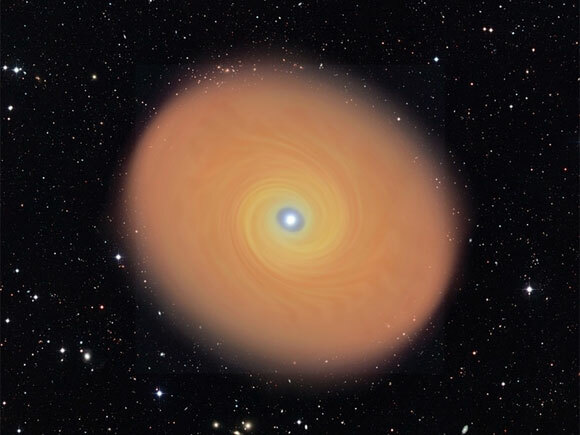 These Keplerian disks could play a key role in the growth of massive stars and particularly explain how enough additional matter can accrete despite the substantial radiation pressure exerted by the young star. One factor is that a stable disk of this type can direct enormous amounts of matter onto the nascent star; another is that it presents a very narrow profile to the radiation pressure and thus a much smaller area of attack than gas which surrounds the star like a spherical shell. Astronomers had previously been unable to detect stable disks around the most massive stellar embryos (O-type stars) with certainty. It was therefore unclear whether these disks were possible explanations at all. The observations by Katharine Johnston and her colleagues, in contrast, show that at least one of the most massive stars can be formed in the same way as its less massive relatives: through mechanisms which are the same as those of less massive stars despite differences in scales and in timing; and with matter which is funneled onto the growing infant star by a Keplerian disk. The high quality of the ALMA observations raises expectations that it will also be possible to clarify further important, unanswered questions about the formation of massive stars. The astronomers hope for information about one feature in particular: very massive stars are nearly always members of twin or multiple star systems. High-resolution images of the innermost regions in the early phases of star birth could show directly how the precursors of the different components of such a system form. 1 Comment on "Astronomers Reveal How Stars Reach Masses of More Than a Hundred Times Our Sun"
well, this may change Sol’s size classification as in the upper 10th percentile of stars. This Keplerian disc may be magnetic. It also poses the interesting question of just how the multiple star systems are made. Are the multiple star systems —“very massive stars are nearly always members of twin or multiple star systems. ” really just residues of the making of an enormous star?